Should we assume that the results of this Global Epi Study were the reason why Sanofi became disillusioned about the prospects of KB001? Or was it an internal strategic decision based on portfolio-review where KB001 just no longer made the cut? The results of the Global Epi Study are published and deserve a closer look. This was a truly impressive surveillance study of the risk for VAP in intubated patients. It involved 1853 patients from 56 centers on 4 continents. Quite uniformly, VAP occurred in 16% of intubated patients, with P.aeruginosa being the most frequently isolated pathogen in 4.1% (or 26% in relative terms), and S. aureus coming in as a close second. Not surprisingly, prior colonization with P. aeruginosa increased the likelihood of developing P. aeruginosa VAP (PAVAP) by a factor of 8. Unfortunately, such predictive surveillance cultures – either as TAs or mini-BALs – are rarely done in clinical practice. So it must have come as a disappointment to the sponsor that other more specific risk factors for PAVAP could not be identified. When only 1 of 25 ventilated ICU patients develops P. aeruginosa pneumonia, an intervention reducing the incidence of PAVAP would be a difficult undertaking. Without a diagnostic tool to hone in on the target population of patients colonized with P. aeruginosa, Sanofi probably felt that there was no workable commercial model to make KB001 a success. Or that the business case was too borderline. We believe this was the main driver for their decision to abandon the KB001 alliance. True improvements in patient care brought about by the introduction of the “VAP bundle”. Numerous publications attest to the fact that intubated patients managed accordingly are less likely to develop VAP . It should also be mentioned that almost all intubated patients receive broad-spectrum antibiotic prophylaxis (for selective decontamination) despite ATS Guidelines recommending a more differentiated approach . So, with fewer cases of VAP around and no good markers to select patients at high risk for PAVAP, Sanofi probably felt this would be a difficult, risky, costly, and not very profitable program to continue. by adding a blinded KB001-A intervention arm. Indeed, demonstrating superiority would not seem all that difficult when you crunch the numbers: Assuming a 33% superiority over placebo, 80% power, alpha = 0.05, and a PAVAP incidence of 20-25%, one would need to enroll approx. 800 VAP patients in a 2-arm study. Expensive? Not really. Feasible? Yes. Not for the faint of heart, of course, but doable. A project attractive for Big Pharma? A difficult sell. Certainly Sanofi had bigger fish to fry – like the new cholesterol drug which just got approved . So, our educated guess is that KB001 fell victim to a reshuffling of priorities at a portfolio review for all the reasons mentioned above. Hey, nothing personal! Others companies are still pursuing the TTSS target, as they should. Let’s see how the compounds from Microbiotix, Shionogi and MedImmune (MEDI-3902) fare in PAVAP prevention trials. Update on Kalobios: The company filed for bankruptcy Dec. 30, 2015. 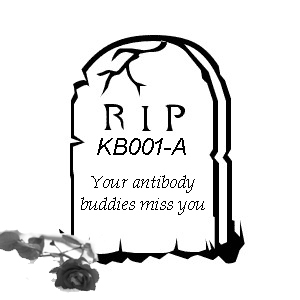 This entry was posted in The News, The Viewpoint and tagged anti-PcrV antibody, antibiotic blog, ATS Guidelines, bankruptcy, cystic fibrosis, discontinued mAb, Fast Track, FDA, IDSA Guidelines, Kalobios, KB001, KB001-A, MedImmune, Microbiotix, P. aeruginosa, Sanofi, Sanofi Pasteur, selective decontamination, Shionogi, TTSS, Type 3 secretion system, type III secretion system, VAP, VAP bundle, VAP prevention, ventilator-associated pneumonia, virulence factors by Harald. Bookmark the permalink.